Pioneer Energy's "mobile cart" can make it easier to capture carbon-dioxide emissions from microbrewery beer fermentation. Reliable, cheap machines in development for future human Mars missions have another, unexpected use: improving beer bubbles here on Earth. The new carbon-dioxide-recycling tech comes courtesy of Robert Zubrin, an aerospace technology entrepreneur and president of the Mars Society. But Zubrin, a craft beer drinker, has found a way to turn his passion for space into passion for pints. 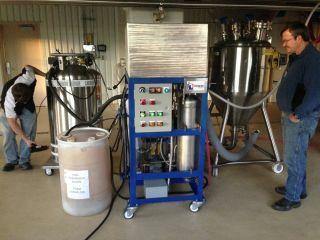 His company, Pioneer Energy, based in Lakewood, Colo., has created a "mobile cart" to make it easier to ferment beer. Pioneer Energy's technology gets around a common problem for microbreweries. Fermenting beer produces alcohol and also carbon dioxide. In a big brewery, their multimillion-dollar systems can capture the carbon dioxide and use the purified version for carbonation and purging tanks, but such systems are out of small microbreweries' reach. Instead, the brewers are forced to let the gas escape and then to truck in carbon dioxide again when it is needed for other parts of the brewing process. Zubrin's gadget, on the other hand, can recapture that carbon dioxide at lower cost. "Our system produces about 5 tons of carbon dioxide per month," Zubrin said in NASA's press release. That amount would be enough for a brewery that makes up to 60,000 barrels of beer annually, he added, and bigger producers could stack the systems to increase production. Pioneer Energy's technology is based upon trying to re-use the carbon dioxide in Mars' atmosphere, something that will be important for future Mars colonies. Zubrin's company fielded more than a dozen orders for his system by mid-2015. A bonus for Mars pioneers and beer aficionados? The system is intended to run by itself. After all, a needy machine on a dangerous planet is just a time sink for the busy astronauts (or short-staffed breweries). "The intellectual capital being developed in NASA's research and development programs is playing out across the economy, and this is just a small example," Zubrin added. "The intellectual capital is the big spinoff."